Sharing her experience with students to help create the next generation of journalists, former CNN justice department correspondent Kelli Arena, who left the network in December, joined SHSU's mass communication department faculty in January as the first Dan Rather Chair. This semester, she is commuting between her home in the Washington, D.C., area and Huntsville to teach a seminar that meets Thursday, Friday and Saturday. CNN’s loss has been Sam Houston State University’s gain. Former justice department/Supreme Court correspondent for the news network Kelli Arena has spent the semester spreading her influence and providing invaluable resources to SHSU’s mass communication students both in and outside of the classroom. Arena left CNN in December to become the department’s first Dan Rather Chair and as part of her duties, is teaching a mass communication class, giving students a “bird’s-eye-view” of the profession she spent 25 years in and educating them on what they should expect in the ever-changing field. “It’s a potpourri of many things with a large emphasis on writing and really understanding the skills it’s going to take to get a job in this industry, which right now is buckling under the stress of the economic pullback,” Arena said. “Another thing I try to inject into the class is an understanding that you can no longer think of yourself as a print journalist or a broadcast journalist or a radio person because the new buzzword is multimedia platforms. Arena joined CNN as an intern while at New York University the summer before her senior year and was there until last December, when the network eliminated the justice beat. She had already been approached to serve as the Dan Rather Chair and was planning to do both until that point but is “actually so thrilled that it worked out this way,” she said. While at CNN, she covered events such as Sept. 11, of which she said nothing could compare, and met her husband, an SHSU alumnus, while filling in for another reporter. A product of the mass communication department, her husband was her cameraman, who has had a successful career of his own working for such networks as CSPAN, CNN and ABC. “Most recently I went to Guantanamo Bay, and was there for the hearing involving the five most high-valued terrorists,” she said. “It was pretty stunning to see these men I had written about for years in the flesh and to see the facility at Guantanamo, which most people never get to see. Her first teaching job ever, now Arena is contributing to society by helping to mold the next generation of journalists at SHSU. While she’s currently commuting between Huntsville and the Washington, D.C., area, where she lives with her husband and three children, Arena makes the most of her time when she comes to campus to teach, giving lectures on campus and working with students outside of class on things such as camera presentation and tracking, or creating voiceovers for video segments. “The students are great here. The thing that attracted me to this university is you have such a diverse student body,” she said. “They’ve sought me out; they are so eager to learn as much as they can. While her current responsibility is primarily teaching, Arena said she’s eager to contribute to the university in as many ways as she can, whether it’s being an adviser for broadcast students, using the skills she acquired as a justice and federal law enforcement reporter to help with the College of Criminal Justice or simply using her influence and reputation to bring more attention to the university. “As a journalist, I’ve never been very good at following the rules, and if I have any say, and I understand that this is a very different environment, I’d very much like to be able to influence as many students as I can,” she said. “I’d like to be involved. I’d like to be helpful where I can be helpful and in a variety of ways. Outside of SHSU, she’s been doing media training, consulting and has filled in on Court TV. 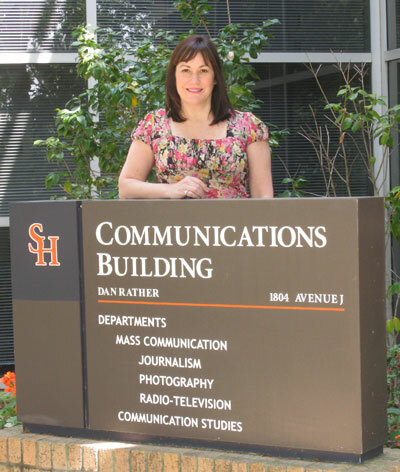 While she’s uncertain of how long she’s required to stay at SHSU as part of the Dan Rather Chair position, she said she would say here “as long as they will have me.